Erie will celebrate the weekend after Memorial Day with messy fingers, continuing a long tradition of good, old-fashioned BBQ. 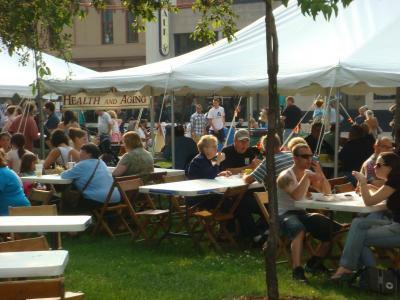 The 28th annual Wild Rib Cook Off and Music Festival will be held from Wednesday, May 30 to Saturday, June 2 at Perry Square Park in downtown Erie. The four-day long event features rides, music and of course, plenty of ribs to sample. Awards will be given for Best Ribs and Best Sauce. People can vote for their favorite ribs, which will determine the winner of the People's Choice Award. Mentions of these awards will often be prominently displayed in bold graphics adorning each vendor's facade. Eight different purveyors of barbecue will be on hand — many operating out of Ohio — along with several other local vendors offering assorted culinary confections. Wednesday night entertainment is provided by The Dock Boys and Acoustic Ear Candy, and Thursday night's lineup includes First to Eleven, Young Talent X3 and HiWay Starr. Friday night features Eric Brewer & Friends and the Jackson Station, and the fun continues into Saturday for the final evening of the festival with music from the Rock School Studios, Monica Lewis Solo, Taylor-Maid and The Breeze Band. Awards will be presented on the main stage at 7:15. Carnival rides are open from 5 to 9 p.m. Wednesday to Friday and 11 a.m. to 9 p.m. Saturday. Ride-a-ribba-ramma passes and ride tickets can be purchased at the booth near the inflatables.